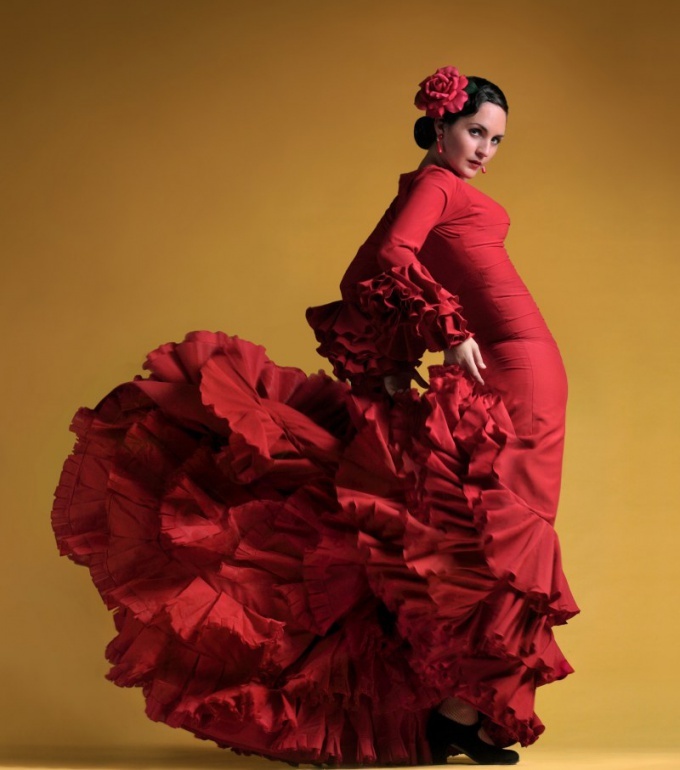 Flamenco – a fiery and spectacular Spanish dance is unthinkable without ringing the clicking of castanets and fascinating writhing movements of the long flounced skirt of a dancer. The sounds of weeping guitar on the front of the audience played an eternal drama titled "He and She". Long dress with a voluminous ruffle – a mandatory attribute of passionate and proud image of the sultry beauty-the Spanish flu. Flamenco dancers can be dressed in a suit consisting of a fitted blouse with flared sleeves and skirts , special cut, decorated with flounces. - fabric width 140-150 cm for the base of the skirt - 2 lengths; for shuttlecocks at the rate of 120-150 cm of frills from 1 meter of fabric. The Foundation skirt for flamenco is the long skirt-the year of the six (or more) strongly flared wedges. The value of the flared hem skirt is from 1 to 2.5 "of the sun" (full circle), which is achieved by various methods cut. For the construction of the pattern of the wedge remove the three measurements: waist (+ 1.5 cm =), thigh girth (+ 1 cm = ABOUT) and length (DI), and define the desired width and number of ruffles. On graph paper draw a vertical line of the middle wedge and the horizontal waist line; parallel to it at distance 19-20 cm through the hips. Aside from the waist line a distance equal to the length of the skirt minus the width of the lower flounce and draw a line bottom. Both sides of the line of the middle wedge is put on the waist line segments equal to half the values of/6, hips – half of the value of ABOUT/6, through the resulting points draw a vertical line.Side-parting between the lines of the waist and hips make little raised lines. The sides of the wedge will continue from the hips symmetrical lines perpendicular to it (the angle of the solution "year" may be less). Put on them distances equal to the value of the cut between the lines of the hips and bottom skirt. The bottom line is make a smooth semi-circular curve. Check the levels of primaqiune flounces (if any). Sew the wedges on the sides long curly and Ratatouille seams. The seam on the left side of the skirt top to leave room for primaqiune fasteners (15-18 cm). Vsheyte hidden clasp-"lightning". On the margins, in places the beginning of recklessne nadsekite corners. Treat sections of the seams on the serger. Sew the belt and run it double closure: one button closure on the outside and a button or hook on the inside. Strong closure is necessary because it will withstand quite a heavy skirt and very vigorous movements of the dancer. The flounces are sewn together from several parts. Every detail is a ring with an inner diameter of 15 cm and a diameter of the outer circle equal to twice the width of the flounce plus 15 cm Number of parts of each flounce is calculated from the length of his primaqiune: this value divided into the length of the inner circumference of one part of the flounce. Take a break and sew details of lower flounce, treat it the lower section of the overlock seam "rulik" of thread to match the main fabric, or, conversely, contrast. Shuttlecocks can make a double – top layer of main fabric, and the lower contrast (and lower layers can peek out from under the top). In this case, take a break and sew both parts of the double flounce, the lower sections of the handle and baste the top slices with each other. The bottom flounce (single or double) sew to the bottom cut of the skirt. Fold the flounce and the cloth of the skirt right sides, combining slices, and lay in place. Zautyuzhte allowances from the wrong side upwards. In the same way take a break and sew on the target the rest of the ruffle, laying them on the cloth of the skirt face to face and a raw cut in the side of the bottom of the product. Can be a little priotity seam grinding from the front side through protohellenic or using a removable sole plate. Skirts for flamenco sewing of thick, but not thick fabric type koshibo, crepe-satin, Georgette, as well as some stretch fabrics. The fabric should be heavy enough to play with the hem of the skirt was more spectacular, but also durable, as it holds a large amount of frills and flounces. Very impressive look of the skirt using a contrasting color of fabric. Considered a classic color in peas of different sizes, black and red combination, figures with large flowers. In skirts and dresses for performances to the hem is sewn inside several ruffles of stiff fabric type of raincoat fabric for more volume and a special effect when playing with the skirt in the dance. Spanish dance has never lost its popularity. The perception of their audience is largely determined by the sumptuous costume in the first place - the famous Spanish skirt with flounces. It is so lush that the performer can, holding his fingers over the hem, raise the arms above the head. And the skirt will still seem long. To sew Spanish skirt in several ways. Spanish classical cut skirt. Wedges should not be less than six. This manufacturing method allows the dancer not only free to perform the movement, but also emphasizes her figure. Start with taking measurements. You need to know the length of the product, the distance from waist line to the hip line, the girth of waist and hips. To the standards of the girth, add 1 cm free customized fit. Determine how much you want to make ruffles, as well as their intended width. Build the pattern on graph paper start with a vertical line. For convenience, cut a piece of graph paper by 20-25 centimeters greater than the length of the product. Lay the sheet vertically and approximately in the middle draw a vertical line. Subtract the length of the product width of the bottom ruffles. The resulting measure put down from the waist line. Through the obtained point do another horizontal line in both directions from the centerline. From the waist line you need to put one more measurement - the distance between the lines of the waist and hips. Through this point also draw a horizontal line. Divide the girth of the waist and hips on the projected number of wedges. The best option is 6, but may be 8, 10 or even 12. Divide these measurements by 2. The measurements are put respectively on the lines of waist and hips in both directions from the centerline, which represents the middle of the wedge. Connect pairwise the points obtained. The line should be slightly curved, the convex part facing away from the center of the skirt. Both lateral lines construct perpendiculars at the points of their intersection with the line of the hips. To build the lower part of the wedge, measure the distance between the lines of the hips and bottom. Mark this distance on the perpendicular bisector you just spent. Endpoint of the connect curve, the convex part of which is directed toward the bottom. Don't forget that shuttlecocks may be several. Mark the pattern on the wedge where they primaqiune. Fold the fabric into 6 layers. The symmetric wedges, so do not care about which side to cut. The pattern can be tailor pin it with pins or tack a thread in several places. Circle wedges, do not forget to leave 1.2-1.5 cm on all sides for seams. Take the belt. The billet is a rectangle whose length is full waist, plus allowances, plus 4-5 cm on the clasp. Its width is twice the width of the belt, plus allowances. Baste and sew between the wedges. This can be done in any order, but the first knit them in pairs on the long sides, then connect together 2 pairs, and at the end sew on the third, leaving the upper part of seam slit for zipper. Seams Ratatouille. Allowances finish with a serger. Where the flare starts, it is recommended to cut allowances to the seam remained of 0.1-0.2 see Vmlite and viacyte zip. Fold belt in half lengthwise right side out, fold and zautyuzhte. Fold allowances inwards and also zautyuzhte. Fold the blank wrong side out and sew the short seams. Sew the waistband to the skirt. The clasp better make stronger. This can be, for example, button and slotting the loop, and the inner side of the pair of hooks. Buttons should not be used as they can fail at the most inopportune moment. For classic Spanish skirts make shuttlecocks. Draw on graph paper a circle with a radius of 7.5 cm From the center will Nefertiti the second circle, adding to the radius of the width of the flounce. Internal and external rings, add a seam allowance. Mark the cutting line, continuing one of the radii. Draw the right and left of this line allowances. Take the desired amount of circles for the bottom flounce. Sew them. The bottom edge of the handle. It is possible to pull up on a regular sewing machine, but it is better to make a "rulik" using the serger. Sew the flounce to the lower cut skirt. Zautyuzhte allowances up. The remaining shuttlecocks do exactly the same. For a simplified version of the skirt flounced ruffles can be replaced. Take strips of the desired width. To sew each have several more or less short strips. First sew the individual parts together. Treat lower part. You can hem ruffles, tucked twice. You can also use a serger. The top edge of the ruffles sew a seam "forward a needle" small stitches or prostrochite to type and structure. Sew the frill to the lower cut skirt. Sew the following ruffles towards the bottom up. Before participate, fold 0.2 cm top edge. Long puffy dressy skirt is just created for passionate woman. Emanates from her somewhat Gypsy or Mexican, and I want to dance to something catchy. For such beauty is not a pity to pay a lot of money, but what if to sew it easier than dancing the cancan. Measure the circumference of their hips. For example, it is equal to the ideal size of 90 cm Cut out fabric rectangle with sides 20 cm (+3 cm for seams) common thread and 90 cm (+5 cm for loose fit and 3 cm for seams). In the end, you should get the pattern 23 x 98 cm This is the yoke of our products. Sewn the edges on the perimeter. Measure the waist circumference. It is again equal to the classical size of 60 cm is so much we need a beautiful wide elastic bands to make her belt. Grind the yoke with the belt on the wide edge. Moreover, the edge patterns we will be on the wrong side, and the edge of the gum (she's beautiful!) on the front. To cut out a rectangle of fabric for the first tier of size 130 cm (98 cm coquette +32 cm at a nightclub) in width and 40 cm in length on a common thread. Ormative it on the short side and folded on the long. Fold in half lengthwise and obtained the middle of a grind with the yoke. We must have two parallel hanging from the front yoke of the Shuttle. To cut out a rectangle 170 cm (130 cm in the first tier of + 40 cm for fluffiness) wide and 50 cm long. Repeat the edges. Fold it in half and grind the middle on the reverse flounce, again gathering the folds to match in size. Get the second tier of our cascade skirt. At this stage, its length is equal to 20+18+23=Continuing 61 see further, you can sew one or two layers to get a long skirt to the floor to Kankan. The final operation is the neat stitching along the skirt from the elastic to the hem. There is another equally effective option of tailoring this dance costume. Since the whole beauty of the dress needs to be seen, and the view in Kankan appears when raising the hem, the option is justified. Take the fabric and cut from it a circle. The sizes are calculated like this: two lengths + 25 cm = the diameter of the circle. Cut in the middle of a circle with a diameter of 22 cm For the fold the fabric in half several times like cutting out snowflakes, and measure from the center 11 see the sector Cut and finish the edges of the fabric. Grab a rubber band as previous cut and sew it according to the diameter of the cut circle. Take colored wide ribbon (preferably satin) and sew them in a spiral around the circumference, a little priborika, on the reverse side. It is not at all the canvas and stepping back from the belt 20 cm, as if labeling the yoke, and to the floor. The last flounce is possible to sew to the edge of the main cloth of the skirt. This outfit is suitable for dancing on stage. In everyday life this kind of skirt usually wear. The most difficult operation of the stitching of skirt from elastic to hem. try to match transverse joints. Before you stitch the details must baste or fasten them with pins.